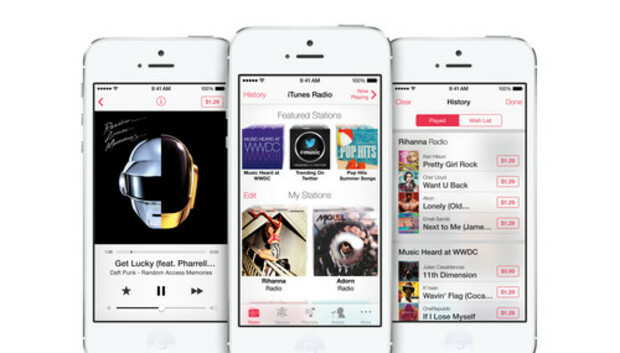 While introducing the remodeled Music app in the forthcoming iOS 7 update, Apple senior vice president of Internet software and services Eddy Cue also took the wraps off the company's upcoming streaming music service, iTunes Radio. Rather than an on-demand service such as Spotify, iTunes Radio has more in common with Pandora, where you listen to stations inspired by a particular track, artist, or genre. You can also create a station from the Stations screen. When you choose to create a new station you'll see a list of genres created by Apple, as well as a field at the top of the screen where you can enter an artist, genre, or song. As you type, iTunes Radio makes suggestions to you. When you've completed your entry, the station will be added to the Stations screen and appear under a My Stations heading. Tap on the station to play it. Play screen navigation is straightforward. If you tire of the song you're currently listening to, just tap on the Next button at the bottom of the screen to move to the next song. Although there's no Back button for moving to the previous track, if you move back to the Stations screen and tap History, you can see any tracks you've played. From what we've seen, you can't then play these tracks in full but rather preview or purchase them. (You can also purchase tracks on the Now Playing screen by tapping their price at the top fo the window). iTunes Radio will be available with iOS 7, built into an upcoming version of iTunes for the Mac and Windows, and accessible through an Apple TV. There will be two models for the service--ad-supported and free or ad-free if you have an iTunes Match subscription, which costs $25 per year. The service will launch first in the U.S. in the fall with other countries to follow.